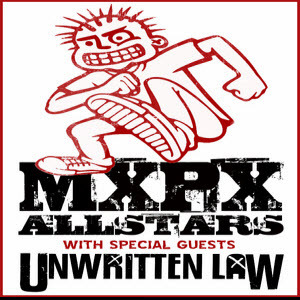 Rockers MxPx and Unwritten Law will be co-headlining a tour coming to Crocodile Rock in Allentown on November 2nd. MxPx, veterans of the skate punk scene, will be touring with their current iteration of the “all-star” line-up which has Jack Parker and Harley Trotland of the band Tumbledown playing with him. Although never achieving widespread mainstream success, the band has amassed a considerable following over the ten years they’ve been together. They released their ninth studio album, Plans Within Plans, earlier this year. California alt-rockers Unwritten Law will be sharing the bill. Their 2002 single Seein’ Red hit the top of the Billboard Alternative chart and saw considerable radio play, and their 2005 single Save Me (Wake Up Call) also hit the top 5 in the alt charts. Following a six year gap, their latest LP, Swan, was released early last year. Santa Barbara-based band Versus the World will be opening the show. Tickets are $15 in advance , $17 at the door and are available here.